What Are Your Green Power Options? Whether you are a homeowner or a business owner, these days, everyone is looking for ways to go green and reduce our impact on the environment by reducing energy use. If green power seems confusing, and you are wondering where to begin, I have a big tip and a great place for you to get started in your energy saving's journey. 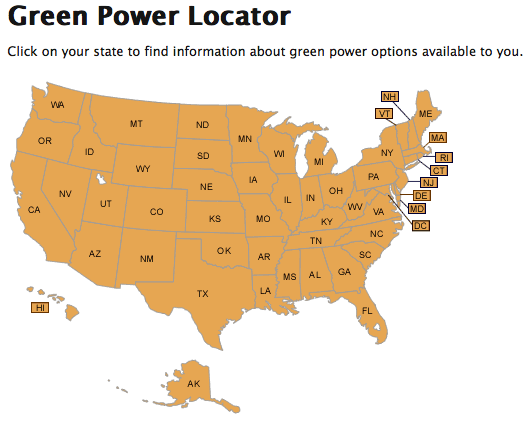 Click on the map below to get started exploring your options as a business and a homeowner to use greener power options. You will be shown the options that are available in your area from state-specific utility green pricing programs and products to national offerings as well. Check it out and be sure to take a look at all of the great resources like energy use tools and calculators and green power incentives that are available.